In this 2 hour evening workshop at the lovely Betty's Sewing Box in Ashbourne, embroider this little linen square using raised stitches and knots typical of this striking monochromatic work. This style of embroidery originates from the ancient city of Guimaraes in Portugal, where traditionally, it was done to decorate clothing and more recently, table linen and aprons. Designed by Cathy, the square measures 8" x 8" and the embroidery is an introduction to this kind of work. Suitable for everyone who enjoys stitching. 6.30 pm. to 8.30 pm. (Parking at the premises or on the street immediately opposite). Tea/coffee and home-made cake will be provided part way through the evening. Yourself! All materials and equipment will be provided, incuding a 6" embroidery hoop for you to use during the workshop. However, you are welcome to bring your own hoop and/or embroidery scissors if you prefer to use them (seat frames are best). £20 per person including all materials. The workshop is an introduction to Guimaraes embroidery, which is typically made up of raised stitches and knots. 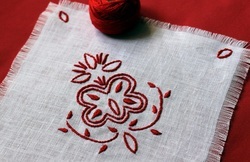 The square is worked on pure white linen using red cotton perle thread and is neat on the reverse! The main stitches used are Portuguese knotted stem and raised fishbone.